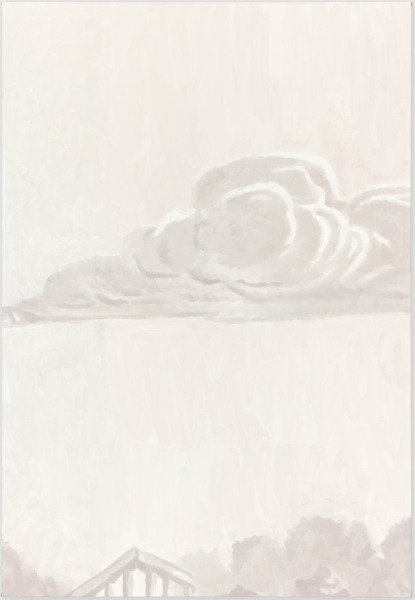 Luc Tuymans, one of the giant figures in contemporary painting, landed in London again last week, with his second show for the David Zwirner gallery here. For anyone pretending to be interested in what is current in the medium, attendance is obligatory. The show comprises a modest number of canvases. To begin with you come face to face with a row of small-scale pictures: cinematically close-cropped portraits apparently lit from within by the cool blue light of digital screens. 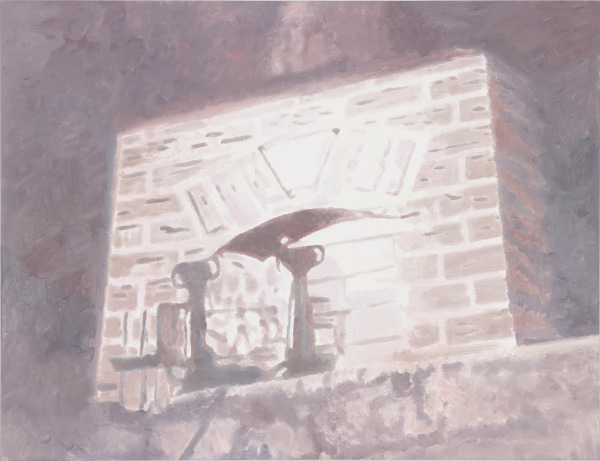 Tuymans’ characteristically cinematic framing – a product of experimentation with Super 8 film in the early 1980s – persists here, but his source material is now often drawn from the internet. The blue aura of these latest works lends them an even more glacially cerebral quality than the extreme, bleached-out pallor of the works for which he became known in the earlier years of his career. 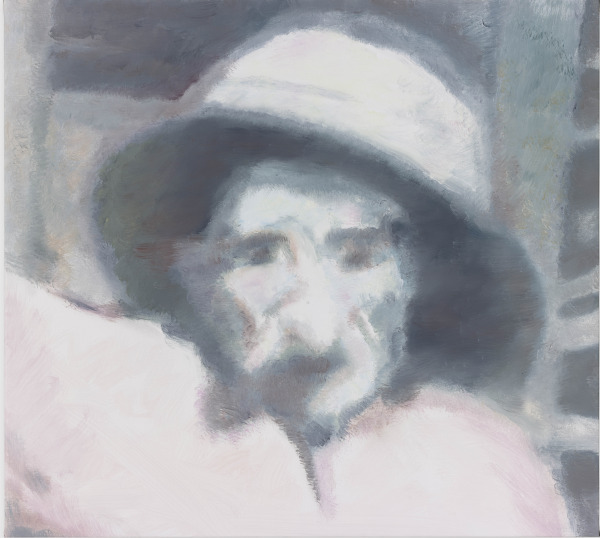 The portraits in question here are made from the artists own recent iPhone snaps of a series of Raeburn paintings in the collection of the University of Edinburgh that first caught Tuymans’ attention when he saw them in an exhibition in his native Belgium as a child. 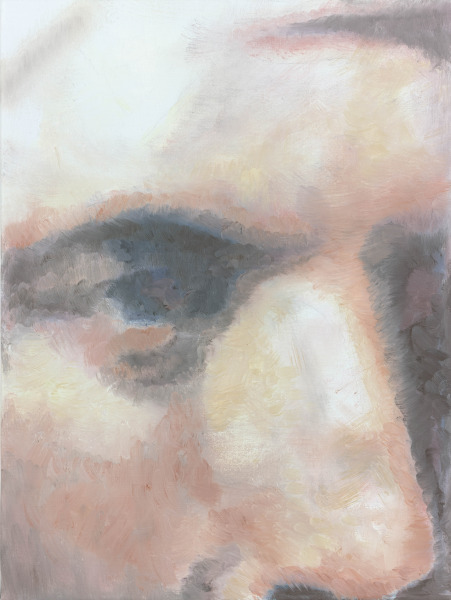 The artist has spoken in recent interviews about a fascination with the demeanour of this series of powerful men, reading character traits into the faces along with a reading of class structures. Upstairs is a portrait of a figure from the more recent past. Issei Sagawa became known as the ‘celebrity cannibal’ after killing and eating a fellow student at the Sorbonne in Paris in the early 1980s. It is an intense and disturbing painting of an individual who perhaps too neatly distils more than one aspect of contemporary malaise. 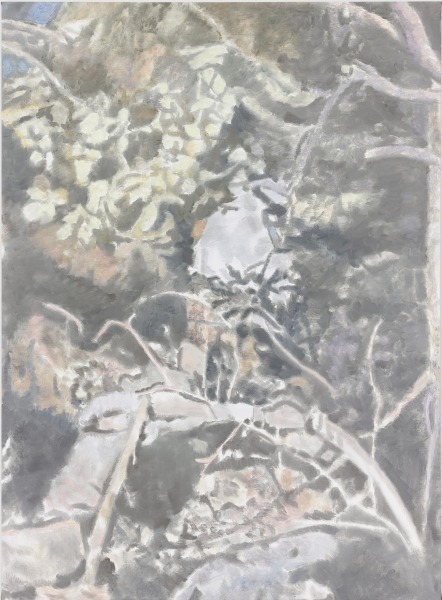 Historical – temporal – distance as embodied through a studied indistinctness of the image has frequently been a device the artist has used to activate horror. 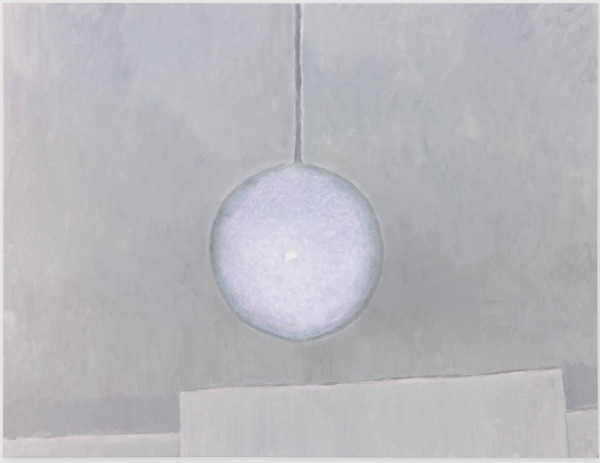 Tuymans conjures monsters in our minds in the same way a playwright might ramp up the terror by having the worst atrocities of a plot happen offstage. Think Titus Andronicus. The painting that has attracted most attention in the show is the eponymous The Shore (2014). 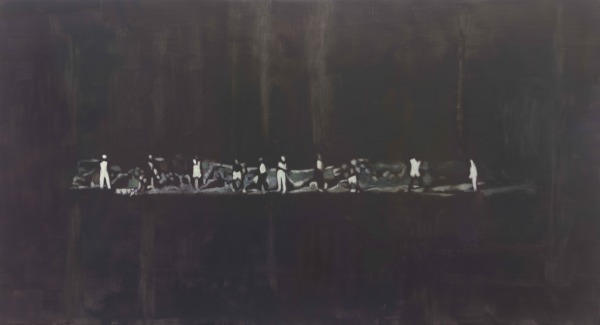 Lifting its composition from a still from an undistinguished 1968 film A Twist of Sand, this large-scale, predominantly inky canvas depicts a group of pale figures, strung out across the picture plane, as if photographed through a rising heat-haze. We are accustomed these days to the quality of aerial drone images from conflict zones, or grainy amateur footage of violence – this reads as something in the same register. 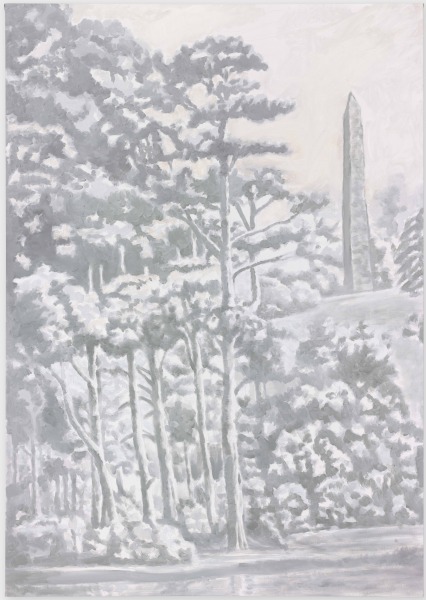 For Tuymans, this is a group of figures moments before execution. Goya hovers as a reference here, but in 2015 the viewer can supply mental images from any number of wars to underpin the painting with trenchant back story. 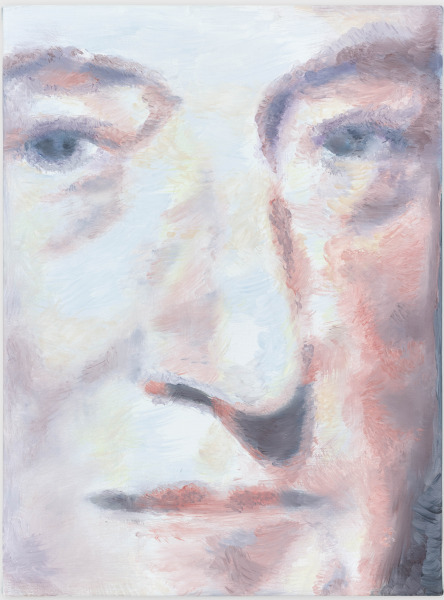 Tuymans claims a kind of radicality for the medium of painting, based on its marginalisation by other, more ‘noisy’ media. Following only months after the extraordinary Anselm Kiefer exhibition at the Royal Academy last year, there’s a great conversation to be had here about the continued fire power of history painting. Discuss.